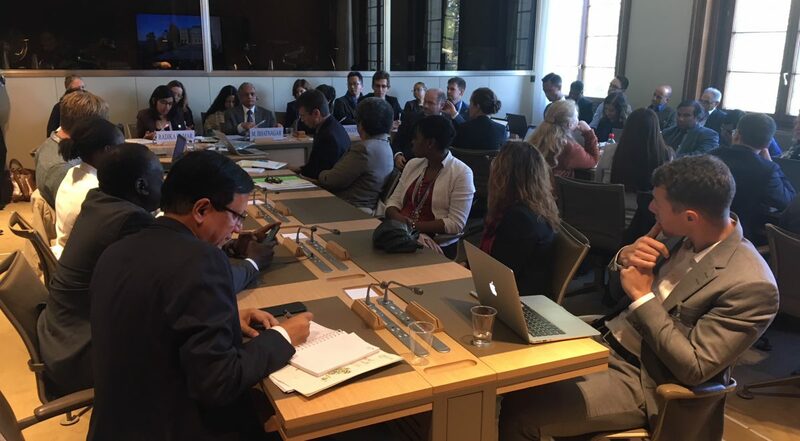 Karibu partner “Our World is Not for Sale” (OWINFS) has this week been participating at the World Trade Organization’s (WTO) Public Forum (the WTO’s largest annual outreach event) in Geneva, Switzerland. OWINFS, a network of organizations, activists and social movements worldwide fighting the current model of corporate globalization embodied in the global trading system, coordinated a number of events at the Public Forum with the aim of fighting for a sustainable, socially just, democratic and accountable multilateral trading system. OWINFS members and their allies hosted several sessions during the Public Forum, all with the aim of of lifting up solutions regarding how trade policy can contribute to resolve the crises of inequality, joblessness, lack of access to adequate natural resources and accessible public services, climate shocks, and other persistent problems in the face of ever increasing extreme wealth and resource depletion. This session examined the implications of what the current proposals mean for the ability of developing and least-develop countries to support their own fishing communities and industries as well as retain the sovereignty to manage their own resources. The session looked at the question of reaching the SDG-2 on ending hunger by 2030, which is a formidable challenge for Sub-Saharan Africa, counting 29% of the world undernourished in 2017 and facing the treble challenge of population explosion, climate change and growing food deficit. Some WTO rules should be changed and the Appellate Body’s rulings on the dumping impact of agricultural domestic subsidies should be complied with. Technologists argue that there will be as much innovation between today and 2021, as there was between 1980 and today. Technological change is running faster than we can adapt to; so, will we find ourselves jobless soon? Why does Big Tech argue that e-commerce is a big opportunity for SMEs and developing countries? Does e-commerce benefit African workers more than American ones? We will debate these and other questions about the impacts of AI and algorithms on the workplace, the ideal rulebook for global e-commerce, the effects of online platforms’ employment model on income inequality, and ‘innovative’ solutions from the past that can keep the neo-Luddites at bay. Leading thinkers from the trade union movement will present where workers stand. With only a few panel speakers, this session aims at discussing these matters mostly with the audience. Organised by Third World Network India, Bangladesh Krishok Federation, & More and Better Network, this event aimed to look at the compatibility between SDG 2 on “End hunger, achieve food security and improved nutrition and promote sustainable agriculture” and WTO rules. Is it possible to meet each of the targets under SDG 2 with the current rules on subsidies and what are the implications of the different possible outcomes of the current negotiations; on export and domestic subsidies including for public food stockholding, Development Box, Green Box, and AMS, as well as for SSM, for developing and least developed countries? Do these help small farmers in developing countries continue to produce and maintain their and others’ food security? How do the WTO negotiations on genetic resources under TRIPS and proposals on e-commerce impact the use of agricultural technology and bio-diversity in developing countries? And are the SDG 2 targets themselves and associated targets on trade in the 2030 Agenda enough to meet the broad aim of the Goal in the developing world or do we need to look for more trade policy space? Platformisation of the economy needs to simultaneously promote the goals of higher productivity and better distribution. While it is undoubtedly raising the levels of efficiency and over-all productivity, its performance in terms of furthering equitable distribution of benefits has not been very good. This session by experts engaging in concrete research on the impact of platforms on development, jobs, and distribution looked at the debates on this controversial topic. Headlines tell us every day that multilateralism is in crisis. The stalemate in the legislative functions of the World Trade Organization (WTO) has been greatly compounded by the attempts by the United States to undermine the judicial function of the dispute settlement system. Many are questioning whether the WTO will survive intact, especially given the expansion of technology-enabled trade. But the United States is not the only country in which electorates are choosing governments which promise to improve lives, sometimes on the basis of rejecting “trade” agreements. Yet the diagnosis and cures being offered differ widely. Millions of people have been lifted out of poverty in China or by exporting to China; yet among OECD countries, China is roundly criticized as maintaining problematic trade policies. Proponents of globalization say that, if they could only “tell their story” better, people would understand that they fundamentally benefit from globalization. Yet even a recent report under the auspices of the International Monetary Fund on globalization notes that benefits largely disappear in the higher income countries, and any benefits are concentrated in the top quintile. Abundant research demonstrates that although technology-enabled productivity has increased rapidly in the last 30 years, workers’ incomes have remained flat. Inequality is rising within nation states, and while some Asian countries are “converging,” the African region is not. At the same time, the digital divide is widening rather than narrowing, threatening to leave unconnected regions like Africa further behind. Thus, rather than being wary of technology, many people are wary of the continued corporate capture of benefits of technology-enabled trade and globalization generally. In order to get multilateralism back on track, governments must conduct a fundamental assessment of the positive and negative implications of globalization, including past 23 years of the WTO, and evaluate the implications for the poor and working people in developed and developing countries; for women; for micro-, small, and medium businesses (MSMEs) which foment the most employment; for developing countries and Least Developed Countries (LDCs); and for the environment. Most of all, clear solutions to resolve the crises of inequality, joblessness, lack of access to adequate natural resources and accessible public services, climate shocks, and other persistent problems in the face of ever increasing extreme wealth and resource depletion must be articulated. How artificial intelligence shapes the way people access information, interact with devices, and share personal data? Artificial Intelligence has the potential to revolutionize societies in positive ways. However, as with any scientific or technological advancement, there is a real risk that the use of new tools will have a negative impact on privacy and human rights. The session looked at artificial intelligence, and opportunities and challenges for digital policies in trade. The WTO Public Forum 2018 is taking place at a time when discussions of the role of trade in promoting SDGs, and the role of an inclusive global trading system are in high gear. The forum is also taking place when there is glaring inequalities both between and within nations, giving rise to the questioning of the multilateral trading system. This is more so for LDCs in general and Africa in particular whose share of global trade has remained low overtime. As new technologies emerge in global trade, ways through which African countries and LDCs can harness them to promote structural transformation and boost her global trade share need to be sought. This working session aimed to provide platform for civil society, researchers, academia, media, government representatives, farmers groups and International Government Agencies to discuss and propose recommendations on how WTO can ensure that technology promotes economic transformation and inclusive trade for Africa. What is technology-enabled trade and what does it mean for Agricultural trade and rural transformation in Africa and LDCs? What should a more inclusive trading system look like so that every Member of society, especially in Africa, – male and female, young and old; is able to reap the benefits of trade in 2030? How can Africa harness new technologies to increase her share of global trade thus realising an inclusive trading system in 2030? How can we make the trading system more inclusive and catering for the development interests of LDCs in general and Africa in particular? How can the WTO address the Doha Development Agenda and ensure that it is not side-lined by proposals of new issues? (a) What new directions do we need in traditional economic and social policy domains – viz. agriculture, labour, education, skill development, credit, support for MSMEs – so that they respond to new challenges and opportunities for gender inclusion in the digital economy? (b) How can emerging policy arenas in the digital economy – particularly e-commerce, digital infrastructure, and data governance – integrate women’s economic empowerment agenda? (c) What role do we envision for governments, businesses and civil society in actionising this roadmap? What are the implications of the DRD proposals for financial regulation given the existence of new financial technologies such as cryptocurrencies like Bitcoin? What are the implications of the DRD proposals for achieving the SDGs including gender equality and domestic resource mobilisation?